With Ghosn gone, Nissan and Renault try to move on — but can they? 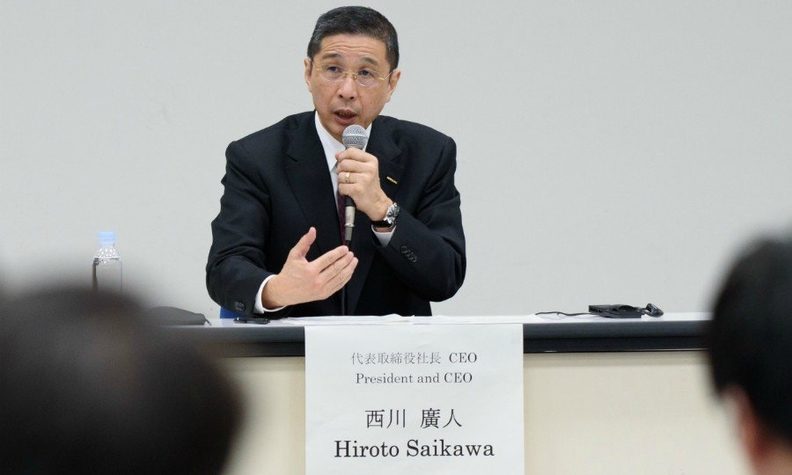 Saikawa has led the charge against Carlos Ghosn, his former boss. TOKYO — Renault and Nissan have been a model of diplomacy since Carlos Ghosn's resignation from the French automaker last month, clearing the way for a return to business as usual. But their desire to move ahead may be easier said than done. A new joint audit of possible misconduct at the alliance is now underway. Nissan is pursuing sweeping corporate governance reform. The U.S. Securities and Exchange Commission is investigating how Nissan reported Ghosn's compensation. And the intentions of the French government — Renault's controlling shareholder and therefore a powerful voice at Nissan — aren't entirely clear nor particularly trusted in Japan. Meanwhile, Ghosn himself is now stirring the pot. While still jailed in Japan on criminal charges of financial misconduct, Ghosn last week conducted his first media interview since his Nov. 19 arrest. He told Japan's Nikkei newspaper that Nissan executives had framed him through "plot and treason" in an effort to stymie Nissan's integration with Renault. Analysts are now picturing various scenarios for what might happen next to the alliance, which finished 2018 as the world's biggest auto group, with combined Renault, Nissan and Mitsubishi light-vehicle sales rising 1.4 percent to 10.76 million, edging Volkswagen Group and Toyota. Continuing with the status quo is considered the ideal way forward for now. The automakers' combined cost savings, joint purchasing, shared manufacturing and intertwined product development are good reasons to keep the alliance humming, many suggest. But the French government is pushing for irreversible integration of the companies. And Nissan, long wary of French interference, is pushing for a bigger leadership role in the alliance. Full merger: In this scenario, Renault, at the urging of a fed-up French government, would increase its ownership in Nissan from its 43.4 percent stake to tighten its grip. The Restated Alliance Master Agreement, the confidential accord that binds the companies, supposedly prohibits Renault from acquiring a stake above 50 percent in Nissan. Going over that would mean a hostile takeover. But there may be another way. Ghosn told the Nikkei last week he had planned to integrate the automakers in a way that ensured "autonomy under one holding company." He said he discussed the plan with Saikawa in September. In his interview from the Tokyo detention center where he is being held, Ghosn said he has "no doubt" rivals cooked up a pretext of misconduct for the "purpose of getting rid of me" to block that deeper union. Mitsubishi Chairman Osamu Masuko said last Thursday that he did not even consider a holding company an option. "I think it would be difficult to have management on an equal footing under such a structure," he said. Rebalance: Nissan could try to block such a Renault power grab by increasing its own stake in the French company. Nissan has a 15 percent holding with no voting rights. If Nissan were to acquire more shares to reach 25 percent, analysts say it would void Renault's voting rights in Nissan under Japanese law and bolster Nissan's independence. Alternatively, if Renault is feeling magnanimous, it could extend an olive branch to Nissan in the form of selling down its stake in Nissan. Renault could use those proceeds to buy back some of its own shares and retire them, thereby raising the ratio held by Nissan. This could rebalance the crossholdings. It could also address the gripe in Japan that Nissan, the much bigger company, has no voting rights in Renault yet accounts for a sizeable chunk of the French company's net income. Breakup: A formal divorce seems unlikely, given the cost of untangling the companies and ending the benefits both receive in an era that prioritizes economies of scale. Saikawa sees room for continued prosperity at the alliance. "By combining our strengths," the Nissan CEO has said, "we have created synergies and achieved profitable growth. These mutually beneficial activities will not change in any way. In fact, we believe they need to accelerate." But friction points persist. Nissan insiders say decision-making is slowed by having to work with Renault as sides wrangle over differing strategies. One showdown, for example, centered on whether the group would give the green light to developing Nissan's e-Power hybrid system. Should the companies reach an impasse, there is precedent for a constructive unwinding. Ford and Mazda spent 37 years building their alliance. But a money-strapped Ford cashed out in 2008 as the global financial crisis hit. Ford spent the next few years selling down its stake, withdrawing directors from Mazda's board and decoupling the companies' factories and product plans. In fact, that divorce is still unfolding. Just last week, Mazda announced it had finally purchased Ford's stake in Changan Ford Mazda Engine Co., a joint venture they both had in China.